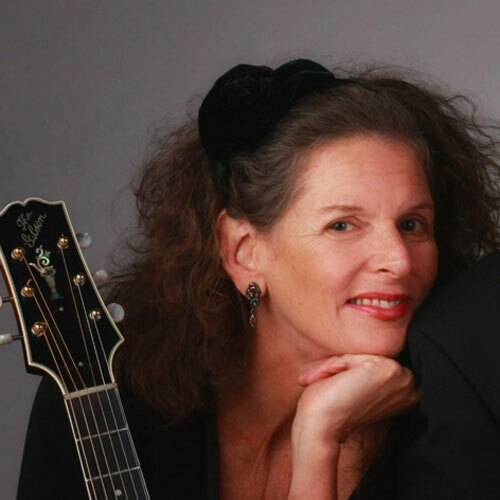 Singer/songerwriter/guitarist Cyd Smith calls her brand of music “progressive folk.” She has mined her background in classical guitar, swing jazz, and American folk and pop music to produce songs sparkling with wit, beauty, and surprises. 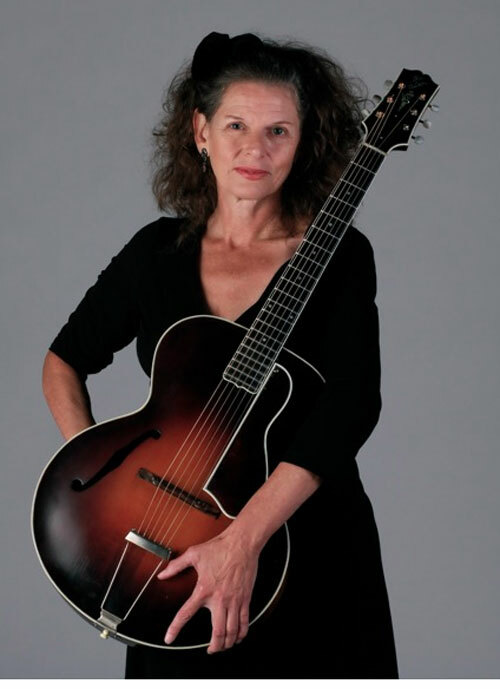 Cyd is also well known as a music educator and teaches at prestigious music camps around the country, including Puget Sound Guitar Workshop, California Coast Music Camp, and WinterSongs West. On your newest CD, [easyazon-link asin=”B00753NV56″ locale=”us”]Wide Open Night[/easyazon-link], you wrote 11 of the 12 songs on the project. Steve Wacker at Victory Music commented that your songs are “filled with gorgeous melodies, spry rhythms and lush harmonies. The uptempo tunes are cheerful, and conjure visions of sunlit frolic and pastoral scenes. They’re just great songs!” So Cyd, how do you do that? Hard for me not to love that quote — I’m so grateful to Steve for his wonderful review. I guess your question is “What’s your songwriting process?” I’m afraid that I don’t really have one. I’m that songwriter who waits for the muse to literally pound on the door and refuse to go away until the song is delivered. I tend to go through long dry songless epochs followed by fertile seasons of songs springing up in all kinds of unexpected, fun places. A song shows up, and if I take the time to tease it out of the shadows, then I have a new song. When I try to force the process through various writing practices, I usually end up with songs that I don’t like. Although there have been exceptions to that rule! Once the basic idea comes, I do love to edit. That’s where I get creative and tinker with the harmonic structure. I usually stick with the melody that first comes to me — if I mess with that too much, it often sounds contrived. I will search for the “money” note — the note that will work with the chords in such a way as to evoke the emotion that enhances the message of the song. I also look for innovative guitar grooves and arrangements that will help make a song work. One of my most requested songs is You Never Said Goodbye from my first album. The lyric is actually about an agonizing breakup, but the the melody and the groove have a singsong perky quality that somehow makes the message palatable — you want to dance to it. The songwriting process is usually a solitary pursuit while producing a CD is a highly collaborative one. How did you decide how to orchestrate and present the songs on [easyazon-link asin=”B00753NV56″ locale=”us”]Wide Open Night[/easyazon-link] to bring them to their full expression? I knew from the beginning the players I wanted — Ruthie Dornfeld whose rhythm, subtlety, and soul make her one of my favorite violinists. Nova Devonie’s accordion playing on my first album still sparkles with wit and originality — I wanted more of that on Wide Open Night. Keith Lowe has a groove that makes all the rest of the music fit together exactly the way I want it. And no other harmony vocalist can make my voice sound as good as the brilliant vocalist Kim Scanlon. So that was where I started. 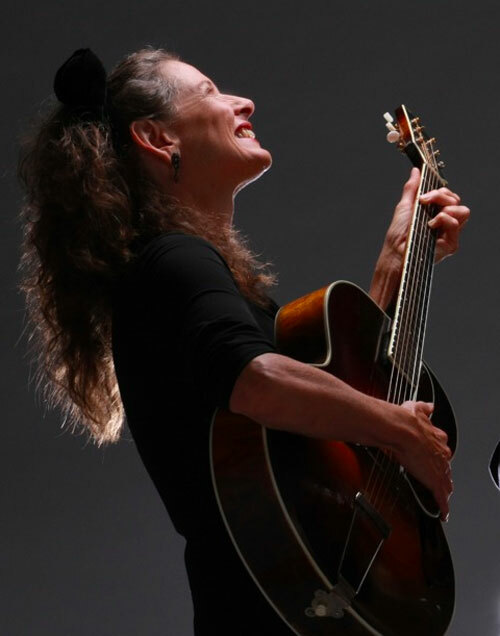 Linda Waterfall, the supremely gifted Seattle songwriter/guitarist, helped me find the theme of the album by going through the potential song candidates and picking those that would create a coherent artistic statement. She helped me find the nocturnal theme. This is an old school album. It really works best if you start with the first song and then listen all the way through. In this day of iPod shuffling, this aspect of the album is probably lost, but it’s one of its strengths. I wrote most of the harmony arrangements and vetted them with Kim, who also added some of her own brilliant touches — my favorites being the trailing line in the harmony chorus of Light Bulb as well as her lush vocal arrangement of On Your Balcony . There were two major logistical problems in creating the CD: (1) I live in Southern Oregon and everybody else was up in Seattle, including the recording studio. (2) Everybody had a very busy schedule and getting the right people in the studio at the right time was difficult, to put it mildly. The big loser was preproduction. We had extremely limited rehearsal time. So the result was a lot of trial and error in the studio. Sometimes things fell together magically. Galileo’s Trio was amazing that way — everybody was somehow in the same spaceship. But often we tried stuff, and then we tried something else. I very much rely on the instincts of the players involved, although I found that I had more opinions than I expected. My engineer Jay Kenney did a wonderful job in helping with aesthetic decisions. In addition to being a fine engineer he is a hugely talented musician. After all the tracking was done, we did a first mix, and I realized that to get the sound I wanted I needed a break from the project — and a more realistic time frame for the mixes. I took four months off and came back to the studio with Julian Smedley, to produce the final mixes. His lightning ears, impeccable taste, impressive studio chops, and inexhaustible good spirits were a huge contribution to the final project. You’ve described your style of songwriting as “progressive folk.” Tell me more about that. Well, you have to come up with something to make you sound special and unique! I guess I came up with that term because my stuff sounds different than most other singer/songwriter material. People who are into folk hear my stuff and think it’s jazz. Of course the jazz folks think I’m a folkie. I started off as a classical guitarist, got into old country/western and bluegrass, and then migrated towards swing jazz, and I incorporate elements of all of those things in my songs, not to mention certain elements of pop. My writing tends to be somewhat harmonically complex because of my interest in the Great American Songbook. Those writers wrote songs with harmonic structures that moved seamlessly through different tonal centers while supporting gorgeous, surprising, and singable melodies. Your songwriting style can also be described as both intelligent and humorous. Is that by design? I just take what my muse gives me. I read a lot (especially 19th century literature), I made my living for years as an editor, and I love beautiful language, so maybe my songs sound intelligent. I do have a sort of gallows humor. Life is hard for most of us, and humor helps us get through. I wrote Little Moon to cheer myself up when I was going through a very dark period. I wrote Lament for Humpty / Waltz of the Wheel as a gut response to the Gulf Oil Spill Crisis. Thinking of Big Government/Oil as Humpty Dumpty put the whole mess into an archetypal framework, which somehow helped me get through it. Hubris has been going on at least since the days of the Greeks. You’ve been a guest instructor at prestigious music camps around the country such as the Puget Sound Guitar Workshop, Colorado Roots Music Camp, California Coast Music Camp, Sound Acoustic Music Camp, WinterSongs West, Augusta Heritage Festival, and the Georgia Straight Guitar Workshop (whew!). What have those experiences taught you about teaching and helping other songwriters and musicians? The biggest thing that the camps have taught me is the importance of musical community. You can take all the lessons you want and practice all the hours you can, but music is about communication, whether it’s with an audience or the musicians you’re playing with. To get everything you can out of music, you’ve got to come out of the closet sometime! Yes it’s risky and scary, like all the best things are, and it’s worth it. The camps are filled with people who love and value music, and who really understand what it takes to achieve even a minimum level of technical and artistic ability. Just one week a year of being around people like that can light a fire that will last you the whole year. You’ll be motivated to be better the next time you come, and if you are, people will notice! Who are some other songwriters you particularly enjoy listening to? I’m embarrassed to say I don’t listen to many contemporary songwriters. Most of my listening time is spent on old jazz. The Tin Pan Alley writers are a big influence: Irving Berlin, Cole Porter, Harold Arlen, the Gershwins, etc. Songwriters that I particularly admire in the second half of the 20th century are Randy Newman, Joni Mitchell, Kate and Anna McGarrigle, Bob Dylan, and JImi Hendrix (not necessarily in that order). Finally, what are the top three songwriting tips you would offer to aspiring songwriters? 1. When an unborn song whispers its way into your ear, stop everything and get it while you can. Ignore the muse at your own peril. I think voice recorders and phones with a recording app are wonderful for capturing stuff when you’re on the run. Just don’t forget to come back to it! 2.There is WildAndCrazy Creator Mind and then there is AnalRetentive Editor Mind. They each have their important function to play in the songwriting, but remember that you have to keep them separate. Don’t try to do both things at once. Nurture and protect WAC Creator Mind and don’t let AR Editor Mind intervene too early in your process. Birth the song, and THEN clean up the baby. 3. I do think songwriting groups can be valuable, if you find the right one — they keep you motivated and if you’re lucky you’ll find a muse there! It’s important for me to work with people whose writing I respect and who can give me tactful yet honest feedback. This isn’t always easy to find. Beware of groups that leave you with bruised feelings and no constructive advice. I have a great group with Kathy Kallick, Richard Brandenburg, and Patrice Haan, three wonderful Bay Area songwriters. Unfortunately I live over six hours away, so we don’t get together often enough. See you all in a few weeks. Looking forward to it.